Showers and thunderstorms likely. A few storms may be severe. High 68F. Winds ESE at 10 to 20 mph. Chance of rain 100%. 2 to 3 inches of rain expected..
Showers likely and possibly a thunderstorm during the evening will give way to mainly clear skies after midnight. Low 59F. Winds NNW at 10 to 15 mph. Chance of rain 80%. 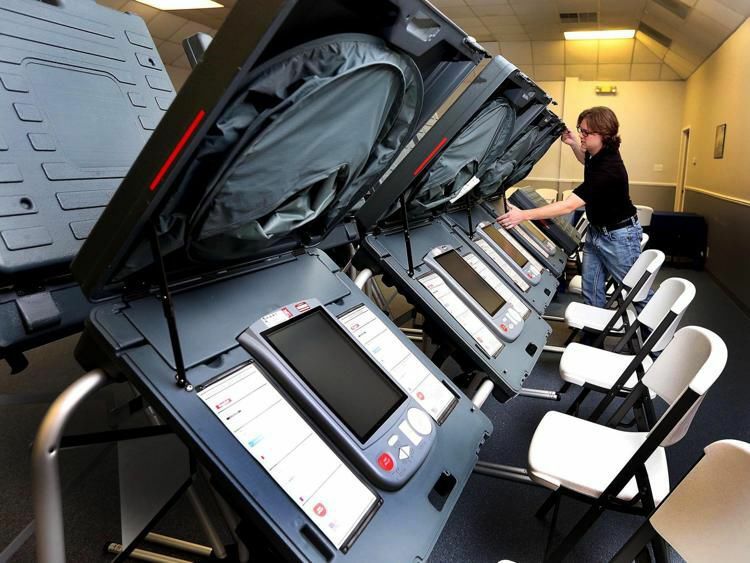 Assistant Elections Administrator Jared Goldsmith assembles voting machines at First Assembly of God Church in preparation for early voting in the 2016 presidential election. 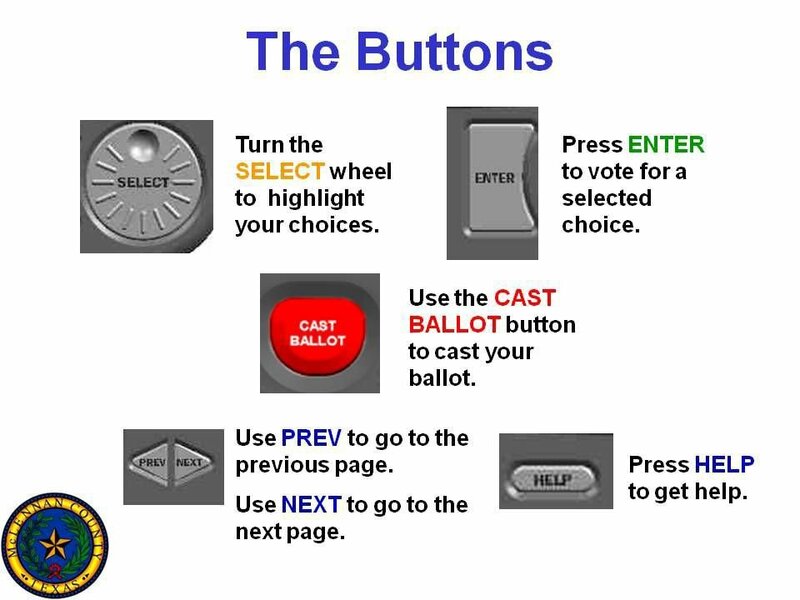 An overview of the buttons on McLennan County’s voting machines. McLennan County and Texas election officials are encouraging voters to review their ballot summaries before hitting the final “cast ballot” button on the Hart eSlate voting machines the county uses. The Texas Secretary of State issued an election advisory stating a number of people had reported the machines appearing to change their straight-ticket selection. However, the issues are likely the result of voters attempting to make a selection before a page is fully loaded, inadvertently deselecting their desired candidate, according to the notice. A lot of the problem is due to eagerness, said Jon Ker, McLennan County Republican Party chairman. The system allows a voter to go back and choose a different name if one is chosen in error. Anyone unfamiliar with the county’s voting equipment can try it out at the McLennan County Elections Administration Office in the Records Building, 214 N. Fourth St., suite 300, in Waco. People tend to want to “emphasize” their vote by selecting it numerous times, County Elections Administrator Kathy Van Wolfe said. She has not gotten any calls about the matter this year but has in previous years, Van Wolfe said. There are a lot of first-time voters this year, and it does not help that the machines are “older than dirt,” said Mary Duty, McLennan County Democratic Party chairwoman. “If that little flag doesn’t wave, you are not done,” Duty said, referring to the screen that appears after a ballot has been successfully cast. Duty said officials in both party offices are continuing to educate voters and are putting out calls for volunteers to serve at the polls. Duty and Ker said they have heard of minor matters at vote centers but nothing major. “We want to have a nice happy election,” Duty said. Ker said the biggest issue he’s seen is the lines. The First Assembly of God Church early vote center location is “unbelievably busy,” he said. A total of 23,180 McLennan County residents have cast a ballot during the first four days of early voting, 16.6 percent of the 139,837 registered voters. Early voting for the Nov. 6 midterm continues through Nov. 2. Waco Multi-Purpose Community Center, 1020 Elm St.